Odisha's slumdog footballer graduates to Bayern Munich! Odisha’s slumdog footballer graduates to Bayern Munich! Top European football club Bayern Munich picked a kid from the Sabar Sahi slum of Bhubaneswar for his exceptional skills in the game. Chandan Nayak was handpicked by the premier club from among 120 children who participated in a global selection round! Bayern of Germany is one of the world’s best football clubs in the world. Chandan’s journey so far, however, has not been very easy. He had overcome life situations when his father abandoned his family. It was his mother who brought him up by doing a maid’s job. And it is needless to say about the difficulties that the family went through as Chandan’s mother struggled to meet the ends. He has marked his place in the game by participating Odisha Junior team at the age of 11. Even though minimum age for participating in the game was 14, his exceptional footballing skills had stumped the selectors. He was coached by Jaydev Mahapatra who speaks very highly of young Chandan’s commitment to the game. “Chandan coming from a poor family stands as a sign of bravery because against all odds, he has proved his talent,” was quoted by ANI. 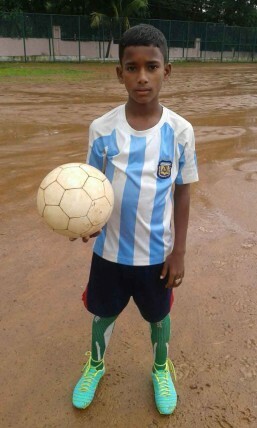 The budding footballer who has idealized Lionel Messi, dreams of playing for Indian national team in the future. Meanwhile, he will leave for Germany on August 25. Four-year-old ‘wonder kid’ from UP enters class nine!